We had two machines, called "Blue" and "Amber" so that long feature films could be run without a break just as in the cinema, using the standard changeover dots to do so. Running the Demfilm every morning day after day I became so used to it that I could do the changeovers just by listening to the soundtrack, not watching the screen at all! (And I think I used to show off a bit with that). 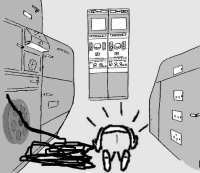 It had seemingly been overlooked by the designers that viewers at home looked at pictures and not waveforms displayed on a tube. For the first year I was living in the BBC Hostel in Bayswater, London, and in the mornings I and some other colleagues also staying in the hostel went by the Underground (Circle Line) to Baker Street, where we caught the BBC bus from BH up to AP. 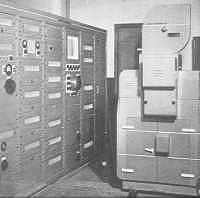 This was a free service to staff, for conveying personnel, files and light equipment to and from the various BBC buildings. I was collecting records, 78rpm discs in those days, and I used to take a selection to work from time to time to play during the lunch break from the gram desks in Central Control. Since tv closed down at 12 noon after the Demfilm until the afternoon programme at 3pm, I thought this was quite safe - until I met someone at the Hostel one day attending a course, who worked at the Holme Moss transmitter. Television came on again in the afternoon at 3pm for an hour of programmes for women. Some of them were compered by Jeanne Heal. She was a lovely lady, but she couldn't see anything without her glasses, but would not wear them in front of the camera! 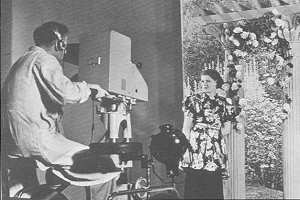 And the cameras in Studio A were the original 1936 Emitrons. During the war years from the end of 1939 until 1946 they had not been used, though it seems the equipment had been powered up occasionally. 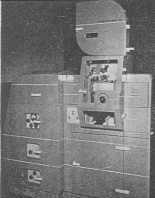 Studio A telecine, or "A Mechau" looked into an Emitron camera and to line this up a few frames of Test Card C on 35mm film were put into the Mechau. 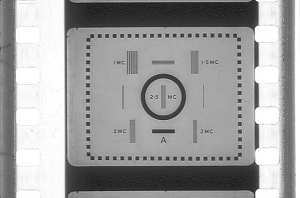 The illustration shows the original Test Card A, (from an actual frame of 35mm film), which had an aspect ratio of 5 x 4. It was not until April 1950 that the aspect ratio was changed to 4 x 3 to conform to the cinema standard. These operators became extremely skilled in quickly adjusting the controls to minimise the "tilt" and "bend" shading effects. 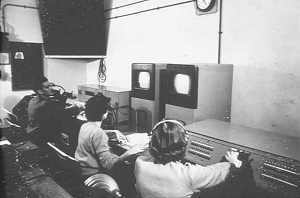 However, when the AP camera crews came under the Lime Grove camera dept, a rota was introduced so that crews would circulate around the studios. 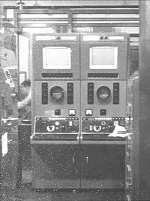 Thus those crews, used to the more modern cameras at the Grove were somewhat at a loss to operate the unique controls of the Emitrons at AP, and picture quality suffered. Another women's programme in the afternoon was presented by Joan Gilbert. She and the Producer didn't get on..... Listening to the comments made over the talkback could be rather exciting (to say the least)..... Publicly, she was well known for her "unpredictable effervescence". At the end of the hour's programme, tv closed down again until 5, and it usually finished with a title slide, that is, a frame of 35mm film stationary in the Mechau film gate, and about the last 20 seconds of Eric Coates' Television March on a 78rpm BBC pressing played from CCR Grams.